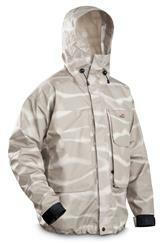 Using the same waterproof fabric and membrane as the award-winning Rapala Eco Wear Reflection Waders, the Eco Wear Reflection Wading Jacket features outstanding waterproof and breathable qualities with a manufacturing process that creates 30% smaller fossil energy use and 35% lower greenhouse gas emissions than regular waterproof clothing. With a mid-length design, the jacket can be worn as a wading jacket with either chest or waist high waters or regular rain pants. The jacket features comfortable, adjustable cuffs and a fully adjustable, full protection hood. The Eco Wear Reflection Jacket has large front pockets for lure storage and easy access hand warmer pockets. The jacket’s sleek design with hidden draw cords and attachment points for tools and accessories allow a tangle-free fishing experience.